Energy Suspension - Circle Track Supply, Inc.
Our initial decision over 25 years ago to specialize in polyurethane and only polyurethane, has established Energy Suspension as the most asked-for name in performance polyurethane components today. Characterized by the experienced as "As much an art - as it is a science", polyurethane continues to amaze the people who work with it. The complex and diverse nature of Energy's proprietary material requires our chemists to dedicate their constant attention to development. This devotion has produced the quality components that our customers continue to demand. With applications to fit most popular vehicles as well as a superb customer support network, ENERGY SUSPENSION is your first quality choice in performance polyurethane suspension components. We are proud to offer our customers the finest polyurethane suspension components available in the marketplace today. Our policy of manufacturing in-house from the initial R & D stages, to chemical formulation, molding and final packaging allows us to control every aspect of the manufacturing process. This ability produces a genuine American-made product and gives our customers absolute confidence in the ENERGY SUSPENSION name. We pledge to continue to be Number One in quality, coverage and customer service because our customers are Number One with us. This is our commitment to excellence. Other Advantages: * Over two decades of in-house experience in innovating, engineering and formulating a wide selection of polyurethane components for many different industries has qualified Energy Suspension as a premier manufacturer of the highest quality polyurethane products available today. * Excellence is company policy, from the initial design stages, where tolerances, preloads and material formulations are made-through the molding processes, to welding techniques, to hardware selection. * This attention to component function and the devotion to quality have resulted in nine U.S. Patents for the company. The Innovations * FIRST with a state-of-the-art on-site new product development program which carefully analyzes various vehicle reactions equipped with Energy's Performance Polyurethane technology. * FIRST with the largest product line in the industry for both import and domestic vehicles, and it still is! 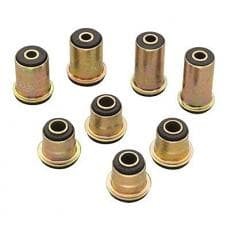 * FIRST with replacement Performance Polyurethane automotive Control Arm Bushings containing outer metal shells. * FIRST with a patented Performance Polyurethane Transmission Mounts utilizing an "Interlocking Safety Feature". * FIRST to offer complete Performance Polyurethane suspension bushing Master Sets for front-to-rear coverage of vehicle suspensions for popular import & domestic vehicles- called THE HYPER-FLEX SYSTEM™. * FIRST with Polyurethane Grease able Anti-Sway Bar Bushings which feature easy grease able zerk fittings. * FIRST with Performance Polyurethane Ball Joint and Tie Rod Dust Boots. * FIRST with a complete Performance Polyurethane Vehicle Product Catalog Web Site that is updated weekly!